he will easily perceive that the Papacy is none other than the ghost of the deceased Roman Empire, sitting crowned on the grave thereof. Leviathan, Thomas Hobbes, (1651), p. 457. “Lateo” in turn, comes from the Chaldee word “lat,” which also means, “lie hid.” In fact, the names “Lat” and “Saturn” are synonymous and both represent the great god of the Mysteries. In the Egyptian version of the Mysteries a fish god “Latus” was worshiped, that is clearly just another version of Dagon [the Merovingian-Apocolyptic Beast from the Sea (Merman) who fathered their “race”]. Although Chaldee was the language of the Mysteries of Babylon, the Latin language has a special connection with the Mysteries, since Latin is the “mystery” or “hidden” language. How remarkable is it then to find that Latin became central in the worship of the Church of Rome! There is yet a further and more direct connection between the Mysteries of Babylon and ancient Rome. However, it is necessary first to explain what happened to the original Babylon position of Sovereign Pontiff of the Mysteries after the death of Belshazzar, the last king of Babylon. The true legitimate representative of the god of the Mysteries, the deified Nimrod, was the king of Babylon as Sovereign Pontiff. The Bible shows how astrologers, soothsayers and magicians always surrounded the kings of Babylon. Following the overthrow and death of Belshazzar by the Medo-Persian Empire under Darius, Daniel was preserved by the grace of God. 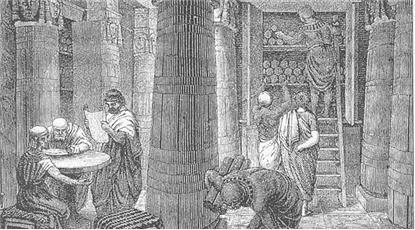 The Chaldean sorcerers and priests, though, were expelled from Babylon and fled to Pergamos, in what is now in western Turkey, where they received asylum and established their central college. The kings of Pergamos, who were regarded as gods, were put in the vacant seat left by Belshazzar and his predecessors. They were hailed as the legitimate representatives of the Babylonian god of Mysteries. It was at Pergamos where the god Aesculapius was worshiped in the form of a serpent. The name “Aesculapius” meant in Greek “instructing snake,” but the serpent also symbolized the enlightening of souls of men by the sun. Thus we see the sun god being worshiped in the form of a serpent, supposedly enlightening mankind as “Lucifer” the shining one [hence Illuminati]. However, the Bible shows the serpent to be the Devil, who first tempted man to sin against God. It is for this reason that the Lord refers to Pergamos as “Satan’s Seat” (Rev 2:13). Notice also the striking similarity between the name of the god of Mysteries, “Satur” or “Saturn” with that of the Hebrew name for the Devil, namely Satan. As the power of Rome expanded into many parts of Greece, Attalus, the last king of Pergamos died in 133 BC and left in his will all the dominions of Pergamos to the Roman people. He further bequeathed the office of Pontifex Maximus to the Roman principate and sent priests to instruct Rome’s Senate in the Mysteries. Thus the kingdom of Pergamos was merged into the dominions of Rome. For many years, though, no one openly lay claim to all the powers and dignity inherent in the title of the kings of Pergamos, namely that of Sovereign Pontiff. The powers of Roman Pontiffs were therefore somewhat restricted, but the situation changed dramatically with the arrival of Julius Caesar. After invading France and Britain in 55 and 54 BC, Julius Caesar assumed the position of Life Dictator over the Roman Dominions in 44 BC. After his assassination in the Senate, a relative of his became Emperor in 27 BC after years of internal strife. His rule effectively ended the Roman Republic. It was from Julius Caesar’s name that the Roman Emperors took their title of “Caesar.” However, few are taught that the Caesars held the position of “Pontifex Maximus,” that is “Supreme” of “Sovereign Pontiff.” This is a very significant fact in history, but it is also very inconvenient to the Church of Rome, for it indicates the origin of the papacy. Julius Caesar was elected to the position of Pontifex Maximus in 63 BC, following which he assumed the position of supreme ruler of the Roman State. Thus he vested in himself all the powers and functions of the Babylonian Pontiff so that he was the legitimate successor of Belshazzar. Not satisfied with this, he was declared to be Jupiter’s incarnation on 25th Dec. 48 BC in the temple of Jupiter in Alexandria. The Encyclopaedia Britannica also says: “There are signs that in the last six months of his life he aspired not only to a monarchy in name as well as in fact, but also a divinity which Romans should acknowledge as well as Greeks, Orientals, and barbarians.” By claiming divinity [Humanism], he followed the pattern of the kings of Pergamos. The Roman Emperors that followed Julius Caesar were commonly regarded as gods.